After Turkish President accuses Israel of killing children, Netanyahu says he bombs Kurdish villagers and will not lecture Israel. Prime Minister Binyamin Netanyahu and Turkish President Recep Tayyip Erdogan traded accusations of involvement in terrorism on Sunday, in the wake of U.S. President Donald Trump’s recognition of Jerusalem as Israel's capital. The back-and-forth began when Erdogan said he would fight against Trump’s controversial declaration, describing Israel as a "terrorist state" that kills children, in a speech in Istanbul. "Palestine is an innocent victim... As for Israel, it is a terrorist state, yes, terrorist!" Erdogan said in a speech in the central Turkish city of Sivas, according to AFP. "We will not abandon Jerusalem to the mercy of a state that kills children," he added. The Turkish president had earlier described the status of Jerusalem as a "red line" for Muslims. Hours later, Netanyahu hit back, calling Erdogan a leader who bombs Kurdish villagers and supports terrorists, during an official visit to Paris. "I am not used to receiving lectures about morality from a leader who bombs Kurdish villagers in his native Turkey, who jails journalists, who helps Iran go around international sanctions, and who helps terrorists, including in Gaza, kill innocent people," he said during a press conference alongside French President Emmanuel Macron. "That is not the man who is going to lecture us," added Netanyahu. Netanyahu’s comments were immediately denounced by Erdogan's spokesman, Ibrahim Kalin, who said, "Instead of taking on our country and our leader, the Israeli authorities would do better to end their occupation of the Palestinian territories." 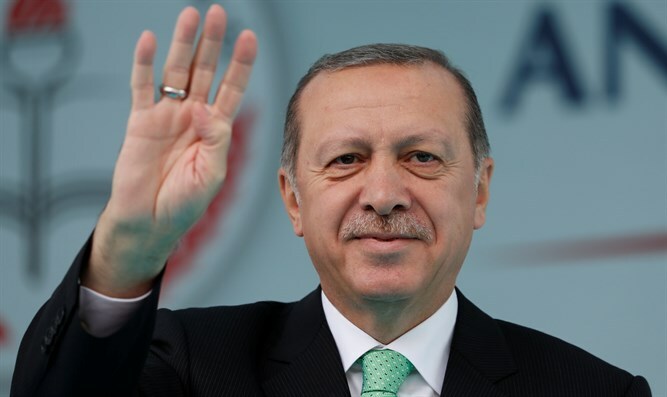 Erdogan has used his position as the current chairman of the Organization of Islamic Cooperation (OIC) to call a summit of the pan-Islamic group on Wednesday. "We will show that applying the measure will not be as easy as that," he added on Sunday, referring to the U.S. recognition of Jerusalem. He said it was "absurd" to deny the Jews' "ancient connection" to Jerusalem. Turkey has upped its rhetoric against Israel in recent days. On Saturday, Turkey’s foreign ministry condemned what it called Israel's "excessive" and "disproportionate" use of force against Palestinian Arabs who protested the U.S. decision to recognize Jerusalem as Israel's capital. Erdogan on Tuesday warned the United States not to recognize Jerusalem as Israel’s capital, or to move the embassy in Israel to Jerusalem, saying that any change to the status quo vis-à-vis Jerusalem would constitute a “red line” for Muslims. He also threatened that his country would sever ties with Israel if Trump went through with the move. A day later, after Trump made his announcement, an adviser to Erdogan said the country intends to sever its diplomatic relations with Israel in response to Trump’s declaration, which he called "aggression against Palestinian rights and complicity with the crime of the occupation." Israel and Turkey signed a comprehensive reconciliation deal last year, ending a six-year diplomatic standoff following a violent encounter between Israeli soldiers and Islamist radicals on a ship attempting to break through the security blockade on Gaza. However, Erdogan has consistently attacked Israel, even after the reconciliation deal was signed. In May, Erdogan spoke out angrily over legal plans in Israel to prevent the use of loudspeakers on minarets to summon Muslims for nightly prayers. In July, the Turkish leader accused Israel of harming itself and the region because of its security measures at the Temple Mount. "With such a disregard of the law, Israel is harming not just itself but the whole region," he said, in the midst of a crisis with the Palestinian Authority (PA) over Israel’s placement of advanced security measures at the compound following a terrorist attack in which two Druze police officers were murdered.